Most malpractice suits are rooted in anger. And when an outcome is bad, or when medical errors happen, some patients become angry. So, it was not unanticipated that when a critically ill Jehovah's Witness patient mistakenly received a unit of blood, her family reacted with outrage. “Physicians are often led to believe the misguided notion that we should be infallible, and that admitting errors will expose us to liability,” said Michael A. Williams, MD, relating the incident, which occurred while he was ICU attending at Johns Hopkins Hospital. But an event that could have ended up in court resulted in the family's expression of gratitude instead. What turned this situation around? Dr. Williams, Chair of the AAN Ethics, Law and Humanities Committee, helped develop the ethical framework for patient safety at Hopkins. Among the tenets is the recognition that all people are fallible, and that while errors occur, we should make a good faith effort to avoid them. Moreover, if a major error is made, it should be disclosed to the patient and family. Over the past few years, an increasing number of institutions have adopted this viewpoint. Neurologist Daniel M. Feinberg, MD, Patient Safety Officer at Pennsylvania Hospital, has always considered it his professional duty to disclose errors. However, when the Medical Care Availability and Reduction of Error Act (Mcare) was signed into law in Pennsylvania in 2002, a provision made patient safety and reporting a requirement for all institutions in the state. When an error occurs at Pennsylvania Hospital, it is the attending physician's responsibility to disclose it. In fact, five states, including Pennsylvania, have laws in place that make in mandatory to disclose medical errors. Twenty-nine states have passed statutes that allow physicians and health care providers to apologize and express grief without their words being used against them in court. For a list of those states, visit www.sorryworks.net/media25.phtml. “This is a skilled conversation,” Dr. Williams explained, “and it should take place by a senior attending, not a resident. “It takes training and experience to know how to handle an angry family,” he explained, adding that it is important not only to teach residents how to avoid errors, but also how to respond to them.” Saying ‘I'm sorry that something happened’ is different from offering ‘I'm sorry that I did something wrong,’ Dr. Williams added. “I can't recall ever having someone take an apology badly or tell me that it wasn't enough, and it virtually always helps us to move forward,” he said. Some institutional policies also include a provision for compensating the patient in a manner that is fair and appropriate. “It is not about avoiding lawsuits,” said Dr. Feinberg, “but rather, about being proactive and doing the right thing.” Yet institutions that have implemented these programs are finding that medical malpractice lawsuits are plummeting. In a US Senate Committee on Health, Education, Labor and Pensions hearing in June, Richard C. Boothman, Chief Risk Officer at the University of Michigan Health System (UMHS), testified that between 2001 when their disclosure program started and 2005, medical malpractice claims and suits have dropped from 262 to fewer than 100. This self-insured hospital system could then reduce its reserves by two-thirds – that is, the funds set aside for future claims, litigation expenses, and losses. Furthermore, their average processing time for claims dropped from 20.3 months to 9.5 and average litigation costs have been more than halved. Doug Wojcieszak, founder of the SorryWorks! Coalition – an organization of doctors, lawyers, insurers, and patient advocates – said, “It is amazing! UMHS has been able to change the behavior of the trial bar in ways that 40 years of tort reform hasn't.” Wojcieszak, whose public relations firm has worked on both sides of the tort reform issue, advises physicians who do not have a disclosure and apology program, to speak with their hospital administration and insurance carriers and request one. He pointed out that many healthcare institutions have disclosure policies in place, especially since the Joint Commission on Accreditation of Healthcare Organizations released standards on disclosure in 2001. At the Harvard Medical Institutions, the buy-in extends to its malpractice carrier, CRICO/Risk Management Foundation (RMF). Luke Sato, MD, Chief Medical Officer for CRICO/RMF, and Assistant Professor of Medicine at Harvard Medical School, said, “Our goal is to develop an educational program that will create experts who can serve on a disclosure response team.” A neurologist by training, he envisions an on-call system with resources that are available to advise providers as soon as a medical error has occurred. “After an adverse event, there is enormous tension between wanting, needing, and being required to disclose on the one hand, and a paucity of facts on the other,” he said. He noted that the circumstances create unrealistic expectations from families and a tendency for physicians to speculate about causes. “But there is a long process to uncover all the facts that led to a medical error, and early speculations may be totally incorrect,” said Dr. Sato. “It is best to stick to information about which you are 100 percent certain,” he cautions. Having these resources available helps coordinate all parties in deciding what to tell the family. 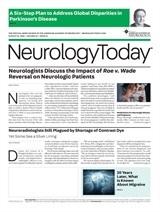 Neurology Today6(22):16,19, November 21, 2006.